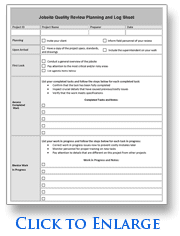 Fill out the form on the right and download your Job Site QC Audit Form and Checklist. The form takes you through each step of your job site review, from planning to each phase of your audit along with a section on corrective actions and preventive actions. This 3 page document includes a simple to use 2 page audit form and a 3rd page for extra note-taking. For more information, read our blog article on conducting a construction job-site audit. You'll receive a complete library of quality control documents, forms, reports, and checklists as part of our comprehensive construction QA/QC plans.